If you're having a particularly lazy, rainy, indulgent afternoon, might I make a suggestion? Get on your streaming Netflix, pop some corn, crack a beer (steap some tea?) and cue up Butch Cassidy and the Sundance Kid. 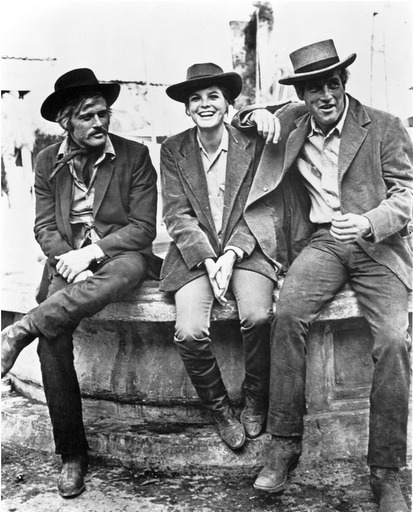 Robert Redford and Paul Newman are the most delightfully charming and comically excellent duo, perhaps ever. (Not to mention two of the most handsome creatures that ever lived.) They play off each other so well, and set the bar for future bromance teams like Vince Vaughn and Owen Wilson in Wedding Crashers. This is just so, so much better, though. I can't put my finger on it really, but it's a style of comedy and dialogue that you don't see in most current films. It may have something to do with the caliber of the acting/directing/producing as well. Katherine Ross as Etta Place could almost fit into my 'dressing the part' series, but I think mostly I just find her beautiful and terrific in this part. Her outfits are, uh, very prairie. this is one of my all-time favorites! what excellent taste you have. Yes this movie flat out ROCKS. They just don't make 'em like that anymore.